The rumored existence of a secret "insider" menu at Chinese restaurants has always intrigued me. What's written in English may be fine, but I've had my fill of moo shu pork and kung pao chicken. What I really want to order is probably scrawled in Chinese characters on the kitchen wall or guarded jealously inside my waiter's brain. But - given my dubious grasp of Mandarin - where could I enter this mysterious, exclusive eating club and taste the wonders of authentic Chinese cooking? The Granite Run Mall in Media, of course. "The mall?" sniffed my Center City guests as they piled into my car and we headed to the far reaches of Delaware County. Yes, indeed, I told them. And we will aim for a parking space right between Sears and J. C. Penney, where the glowing red sign of Margaret Kuo's Peking beckons like an exotic port. The ubiquitous Kuo also has opened a smaller version of Peking in downtown Media, owns Margaret Kuo's Mandarin in Malvern, and is building a fourth restaurant, slated to open in November, in Wayne. But Kuo got her start 28 years ago at Granite Run. And the former chemist has been determined to introduce authentic Chinese cooking to the masses ever since, offering shark's fin soup, alongside the traditional wonton, and more than a few rare provincial specialties. She has since added a superb sushi and sake bar for extra trendy appeal. And the restaurant's space (her second location in the mall) has been polished to an impressive elegance, with a sleek granite foyer and well-padded booths in a dining room decorated with carved wooden screens, massive Ming-style vases, and a working gong. 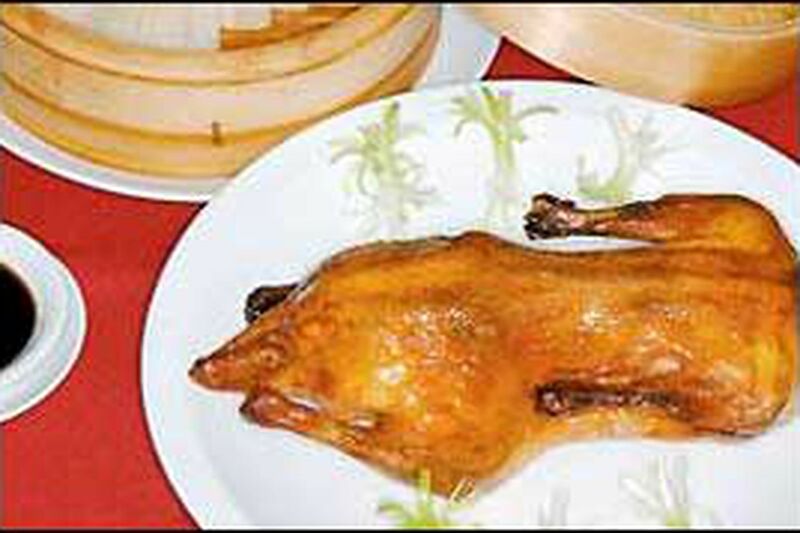 Every restaurant should sound a gong, I think, to announce the arrival of another Peking duck in the dining room, and have a venerable duck chef like Zhang Ho, who effortlessly carved the bird tableside for us in his white hat and black tennis shoes. The cooking here is as regal as the ceremony. The duck was roasted tender and lean, then wrapped with scallions and pieces of honey-crisped skin inside supple envelopes of particularly fine homemade pancakes. Peking has a secret Chinese menu, too, with interesting goodies such as duck palms and slippery sea cucumbers that are available if you know to ask. The fried bean curd and scallop balls called zhu sen tofu, which come napped with a velvet crab sauce and gauzy strips of bamboo fungus, are definitely worth seeking out. But Peking also offers far more authentic specialties on the English menu than most. All you need to do is stumble across an extraordinary waiter like David Yu to give you a guided tour. Yu's eyes widened when he sensed a table of diners eager for culinary adventure. Before we knew it, we were sipping delicate silver needle tea, savoring steamed pork buns splashed with gingery black vinegar, and crunching on the tail fin of a fried whole red snapper glazed with tangy Hunan gravy. I've also had less exciting service here from an inexperienced waiter, but even that couldn't dim the kitchen's delights. The Shanghai braised pork shoulder is one of the best dishes I've sampled in the last year. The massive, osso buco-like hunk of pork was so tender from a six-hour turn in the oven that, at the touch of a fork, it fell off the bone into an intensely reduced gravy scented with anise. A brilliant green corona of fresh Shanghai cabbage (similar to baby bok choy) ringed the pork. The Peking-style shrimp was another highlight that showed the restaurant's commitment to fine ingredients and subtle cooking. The large, succulent shrimp basked in a clear sauce that was delicate despite fistfuls of chopped garlic. The quality of the filet mignon was also impressive, the meat sliced into thin lily pads paired with smaller rounds of shiitake mushrooms in a peppery sauce. Among the appetizer specials printed on a blackboard menu, we loved the baked Chinese leek buns and the open-ended dumplings, half-moon-shaped pouches with holes that allowed the oil to cook the filling directly, tenderizing the gingered pork. For more conservative diners, Peking offers fine examples of more familiar dishes. The General Tso chicken is tender and perfectly fried, its dark sauce the perfect balance of sweetness and spice. Tiny dried chiles give a potent dry heat to the kung pao shrimp. The kitchen also offers a few worthwhile upgrades to standard soups. The wonton, a house specialty, is a golden broth filled with thin-skinned shrimp-and-pork dumplings. The exceptional hot-and-sour seafood soup is less hot and sour than most, spiked with white pepper instead of chile oil so the seafood flavor shines through with a full, sherry-splashed richness. It would be hard not to love this food no matter who served it. But a waiter like Yu completes the Peking experience. Not only does he pace the meal and tend the table with aplomb, but he interprets the menu's flavors and philosophy more adeptly than most servers I've known. The sushi bar, presided over by Tony Chen, also offers some excellent composed dishes: tuna nuta, pristine sashimi sauced with sweet miso; naluto, which holds a trio of salmon, tuna and whitefish inside a tube of refreshing shaved cucumber; and an awesome angel roll, which wraps fish and matchsticks of sweet apple inside delicate sheets of white seaweed blanched and tenderized with vinegar. But leave it to Yu to put his own spin on the sushi. He presented a plate of usuzukuri - gossamer slices of raw striped bass fanned around a pool of citrusy soy ponzu sauce - then deftly rolled each ribbon of fish into a tiny bundle around a sliver of shaved lime. Cushioned by a layer of sweet fish and enlivened by the puckery ponzu, the usually bitter citrus rind found new life inside this package, washing across my palate with an intense burst of zest that I didn't expect. How could I have, though? It wasn't on the menu.